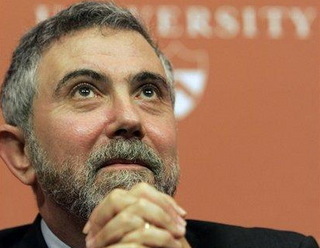 Krugman deserved to win a Pulitzer for journalism. Tuesday, he won a Nobel Prize in Economics. I am overjoyed. But I don't really know anything about economics. Next year, I say, it's the Pulitzer for Krugman. ... by the time it became possible for urban Britons to eat decently, they no longer knew the difference. The appreciation of good food is, quite literally, an acquired taste--but because your typical Englishman, circa, say, 1975, had never had a really good meal, he didn't demand one. And because consumers didn't demand good food, they didn't get it. Even then there were surely some people who would have liked better, just not enough to provide a critical mass. In these times of anti-elitist hysteria, the notion of quality itself can be made to sound suspect. And yet, food culture appears to be thriving these days as the population becomes more knowledgeable about the variety and quality of food, how it is produced and how it is prepared. Chefs are celebrities. The Food Network presents cooking as entertainment and education. Is it possible that a similar film culture could embolden the popular appetite for movies? As palates become more adventurous, attuned to unfamiliar and sophisticated flavors, could tastes in movies develop and diversify as well? How might such a thing occur? Is there... any light in the darkness of inanity?